Join us for an evening of improvised creative music with Tim Perkis, Phillip Greenlief, Shanna Sordahl, and Amy Reed. microspoke is a new duo project from Phillip Greenlief and Tim Perkis that uses quiet, microscopic noise as a landscape to explore highly detailed electro-acoustic improvisation. the duo made their west coast premiere at this year's KZSU's Day of Noise. Amy Reed is a visual artist and composer living in Sacramento, California. She is the founder of Ma, a series that supports creative work by women at Gold Lion Arts. She studied extensively with Sarah Flohr. Recent work includes: "nine years in the mountain river basin" - video and performance. Solo – electric guitar, Ione’s 20th Annual Dream Festival; virtual Artists-in-Residence dream duo with ecologist Dr. Leo Polansky, large ensemble work with Phillip Greenlief, and an active duo with Ross Hammond performing original compositions, improvised, and traditional material for guitar and voice. Shanna Sordahl is an American-Canadian sound artist/composer/performer/collaborator living in Oakland, CA. Her interdisciplinary interests and love of diversity cause her work to take on many forms, from composition and live performances to site-specific installations. Shanna’s multifaceted background allows multiple streams of influence to seep into each of her projects. The fusion of acoustic instruments and sounds with an electronic music approach infuses and shapes her work. This has given her a particular awareness of sound and timbre that she strives to re-contextualize in new ways. Since his emergence on the west coast in the late 1970s, Evander Music founder and saxophonist Phillip Greenlief has achieved international critical acclaim for his recordings and performances with musicians and composers in the post-jazz continuum as well as new music innovators and virtuosic improvisers. He has performed and recorded with Fred Frith, Meredith Monk and They Might Be Giants; albums include THAT OVERT DESIRE OF OBJECT with Joelle Leandre, and ALL AT ONCE with FPR (Frank Gratkowski, Jon Raskin, Phillip Greenlief). 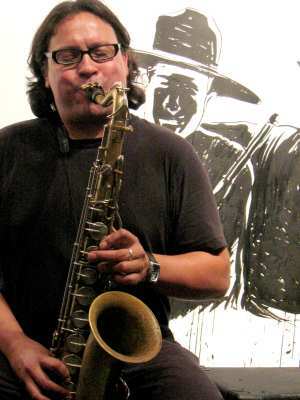 Recent residencies have included Headlands Center for the Arts and from 2012 to 2014 he was the curator at Berkeley Arts, a home for progressive music. He is the recipient of a San Francisco Bay Guardian Goldie Award. Tim Perkis has been working in the medium of live electronic and computer sound for many years, performing, exhibiting and recording extensively throughout North America and Europe. His work has largely been concerned with exploring the emergence of life-like properties in complex systems of interaction. A founder of the computer music band The Hub, he is also a well known performer in the San Francisco Bay Area's active improvised music scene, and a designer of multimedia systems for corporate clients. Recordings of his music are available on the Artifact, Lucky Garage, Meniscus and Limited Sedition labels.